Google has announced its “Pay with Google” feature, which speeds up the digital payment process. Users on Android and Chrome for web can now directly pay by choosing from their pre-saved debit or credit cards to pay for various goods and services. Users can choose to pay using their saved credit and debit cards on their Google account, which have been added via Google Play, Chrome, Youtube or Android Pay. While using pay with Google, users need to select from their saved cards and enter a security code or authenticate with their device. Google automatically sends payment and address information to the merchant from a user’s account without requiring any additional information from the user. While paying for any product online, users need to fill in multiple details of their credit and debit card. This drags out the payment process and many times users encounter errors or the session expires. In its official blog, Google said that the new feature will allow users to save time by skipping on filling multiple forms during the payments process. 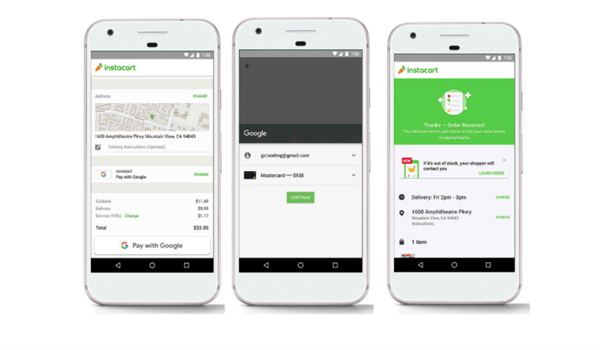 Pay with Google can currently be used on the Android platform or Chrome browser at select places in the US. These places include: Instacart, Spot Hero, Dice, Hotel Urbano, Doordash and more. Other brands such as Airbnb, Papa Johns, Hotel Tonight, Hungry house, Just Eat and more will soon start supporting Pay with Google. Google has mentioned that it is not charging any transaction fee for the service.